After the pseudo strip-tease surrounding the 2010 Chevy Equinox, we finally get a real look at its newly revised face and we've gotta say, GM must have rediscovered the French curve recently. The Theta platform crossover gets a surprisingly swoopy C-pillar and a very Malibu-like grille, but those headlights offer a more softened approach to the face of Chevrolet. Aside from the new nose and glass, the Equinox is also sporting some rather aggressive, albeit tasteful, fender flares reminiscent of the Mercedes ML. Our spies at KGP have worked up a report on the fresh-faced suvvie which we've seen fit to include below. 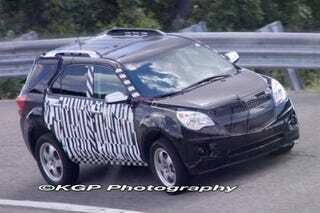 Although a single semi-official image has been released of the 2010 Chevy Equinox, GM test teams have continued to run heavily camouflaged prototypes on public roads and even within GM test tracks. That changed today, when a fully uncovered prototype hit one of General Motors' internal test loops—allowing us to get the first spy shots of an unclad Equinox from multiple angles. We can now confirm the accuracy of the original low-res "release" photo, along with our first uncovered look at the crossover's rear 3/4 view. We can now get a much better feel for the interplay of the C- and D-pillars, and the pleasing chiseled nature of the rear hatch. The tail-lights have some interesting surface development, although from the the side they look a bit like the rear lamps on the Dodge Durango. On the rear bumper, the dual exhaust tips flank what appears to be a chrome inset to match the similar bit of brightwork visible on the front air-dam of the Equinox in the leaked image.